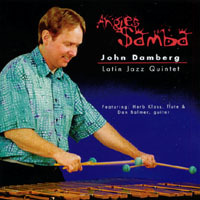 This CD contains the original Latin jazz compositions of noted Alaskan percussionist and composer John Damberg. John is accompanied on Angie's Samba by the members of the Anchorage based John Damberg Latin jazz Quintet including: John Damberg-maimba, vibes, steel drum, Latin percussion, Herb Kloss-flute, Dan Balmer-guitar, Dirk Westfall-bass, and Chuck Henman-drum set. I have always loved songs that fuse the exciting rhythms of Latin America, the Caribbean and Brazil with well written, memorable melodies and lush harmonies. The compositions on Angie's Samba combine these elements into well crafted songs with interesting melodies and rhythms. Well written songs tell musical stories and evoke feelings and emotions in the performers and listeners. They provide a fertile ground for the performers to create inspired & evocative improvisations. Songs should evolve as the musical story develops using changes in instrument timbre, the feel of the groove, and the colors created by using different instrumental orchestrations. I am drawn to the sound created by the combination and blending of the marimba, vibes, flute and guitar. They create a sound that is lush and percussive at the same time. They can express emotions from dream-like to rhythmically driving and primal. The origins of these instruments are folkloric in nature and evoke a certain sense of connection with one's surroundings, one's past, and the heartbeat of Mother Earth. When combined with the driving rhythms of the Latin rhythm section, they blend to create an exciting sound for the listener to enjoy. I have used primarily acoustic sounds on this CD to enhance the listener's connection to the music.